Our thinnest Fire tablet yetâ€”with stunning 8" HD display, fast quad-core processor up to 1.5GHz, rear-facing 5MP camera and front-facing HD camera, and up to 200 GB of expandable storage. Keep photos, movies, and compatible apps and games with you using a microSD card slot to expand your tabletâ€™s storage by up to 200 GB. Plus enjoy free unlimited cloud storage for all your Amazon content and photos taken with your Fire device. Don't be tethered to an outletâ€”With up to 8 hours of mixed-use battery life Fire HD 8 gives you the flexibility to go wherever the day takes you. Whether youâ€™re looking for your favorite playlist on Spotify or need a quick joke, you can ask Alexa.Â Just press and ask for a song, artist or genre, and stream directly over Wi-Fi.Â Alexa also provides voice control for Pandora, Spotify, TuneIn, IHeartRadio, and more. Alexa works with devices such as lights, switches, thermostats, and more from WeMo, Philips Hue, SmartThings, Insteon, Nest, ecobee, and Wink. Switch on the lamp before getting out of bed, turn on the fan or change the temperature on your thermostat while reading in your favorite chair, or dim the lights from the couch to watch a movieâ€”all voice controlled from your tablet. In addition to Alexa, our next Fire OS update will also allow you to quickly access great game play directly from the Games tab with Twitch, the worldâ€™s leading social video platform and community for gamers. Fire tablet owners will also have easy access to over 65,000 recommendations from ComiXology, which provides an unrivaled library of comic books, graphic novels, manga and more. 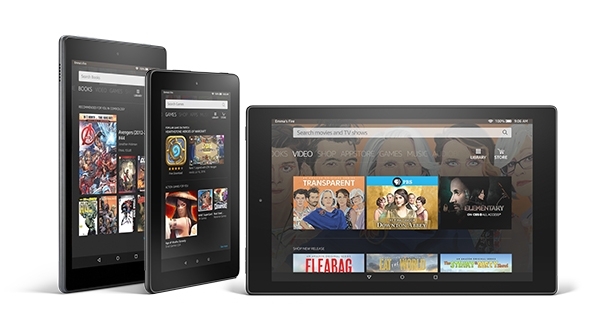 Fire OS is the best entertainment experience on a tablet with quick access to the things you do most. The home screen includes dedicated content pages for books, games, and apps, video, music, audiobooks, and Newsstand, making it quick to pick up right where you left off. Powered by Amazonâ€™s recommendations engine, you can quickly browse books, movies, TV shows, music, apps, and games suggested just for you. Family Library links your Amazon account to that of your spouse or partner so you can easily share apps, games, audiobooks, and books, and it now allows Prime members to share their Prime Video content. Access your family's content across devicesâ€”both Amazon devices and free Amazon apps for other platforms, including iOS and Android. On Deck automatically downloads Prime Video (for Prime members) and the first episodes of Amazon Original Series while your device isnâ€™t in use, ensuring that there is always something new to enjoy instantly, even when offline. Screen Sharing brings Mayday-powered customer service to Fire tablets. Simply call customer service and Amazon experts can connect to your Fire tablet to co-pilot through features by drawing on your screen, walking you through how to do something yourself, or doing it for youâ€”whatever works best. Coming soon: Alexa, a cloud-based voice service that provides quick access to the entertainment you want, including music, games, audiobooks, and more. Ask questions, shop, find news, weather, and more - just press the home button and ask. 8 GB or 16 GB of internal storage. Free unlimited cloud storage for all Amazon content and photos taken with Fire devices. Add a microSD card for up to 200 GB of additional storage. Prime members get unlimited access to over a thousand books and magazines, more than a million songs, and thousands of movies and TV episodes - at no additional cost. 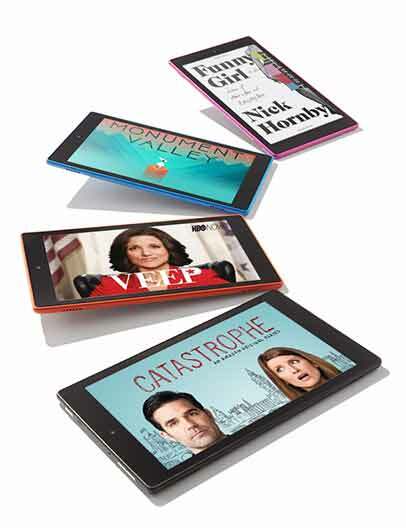 Top Level Categories for Fire HD 8 Tablet, 8" HD Display, Wi-Fi, 16 GB - Includes Special Offers, Tangerine (Previous Generation - 5th).